Editor's Note: The post originally appeared on Social Media Examiner. 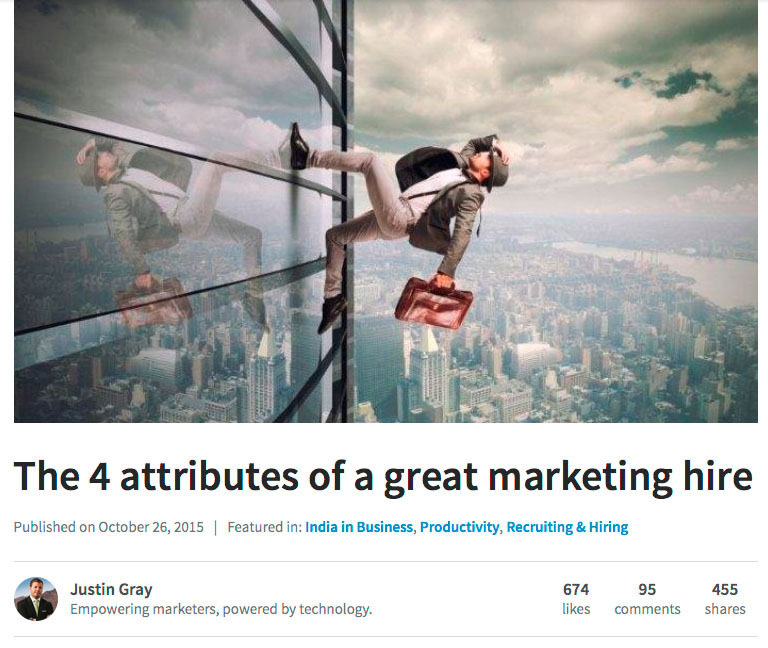 Are you taking advantage of all of LinkedIn’s content marketing features? Do you know what types of content work best on LinkedIn? With a few tweaks to what you post on LinkedIn, you can build brand awareness, generate leads, and drive more revenue. In this article you’ll discover how to maximize your LinkedIn content exposure. Don’t Stop Here: access all of our LinkedIn Content Marketing Resources. Your LinkedIn company page is where you can catch the eye of prospects and build relationships with customers. Share content that is valuable to your audience, answer questions, and solve problems. This allows you to nurture genuine relationships with your followers and build brand awareness with your ideal prospects. You can also follow these 5 tips for attracting the right audience to your company profile. This Symantec update drives registrations for an upcoming webinar. Company updates that contain links can have up to 45% higher follower engagement than updates without links. Suggested time commitment for success: 1 hour daily/4 hours weekly/10 hours monthly. Post three to four times a day and engage with and respond to followers’ comments. Be sure to change your header image every six months to avoid creative fatigue. Intel‘s company page celebrates a company milestone in this update. This Volvo update announces a product enhancement that will appeal to their target audience. LinkedIn SlideShare has more than 70 million monthly unique visitors, and nearly 4 million visitors (on desktop alone) on an average day. With 13,000 new pieces of content added daily, SlideShare is a platform you can’t afford to overlook. 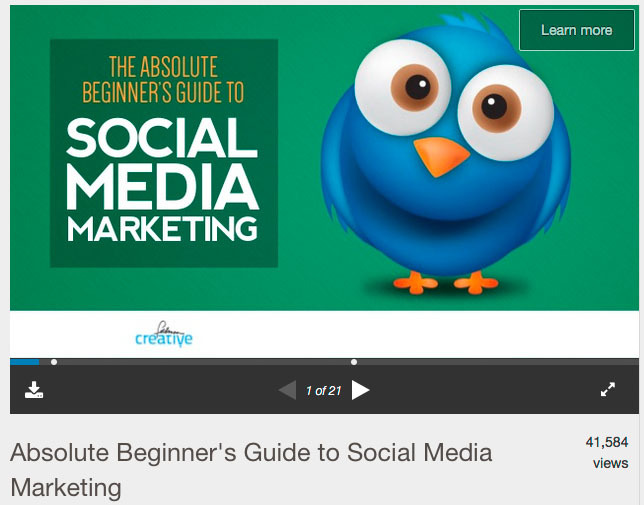 Barry Feldman of FeldmanCreative shares a nicely designed, helpful social media basics ebook on SlideShare. Suggested time commitment for success: 30 minutes daily/2 hours weekly/6 hours monthly. HubSpot shares slides from Dharmesh Shah’s talk at the 2016 SaaStr Conference. The slide deck features lessons on SaaS, pricing, culture, MBAs, and customer happiness. To ensure you succeed with SlideShare, upload new content weekly, highlight decks on profile pages, group content into playlists, and add lead forms to help achieve lead-generation goals. You can also link your SlideShare presentation to your website to gain a quality inbound link. 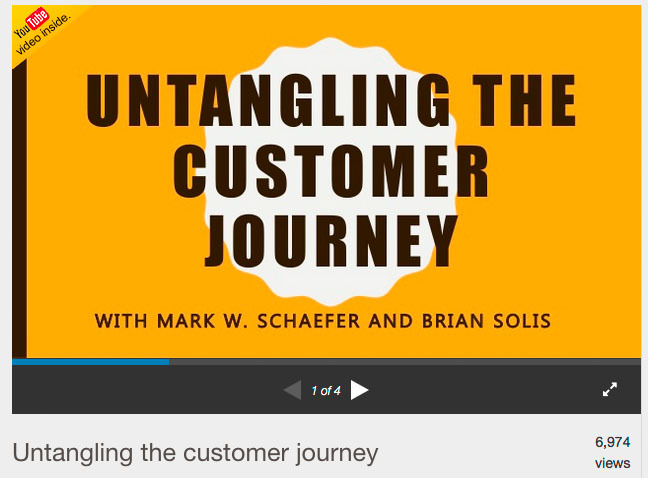 In this special video presentation, authors Mark Schaefer and Brian Solis explore the new idea of engineering customer experiences and a new marketing trend. 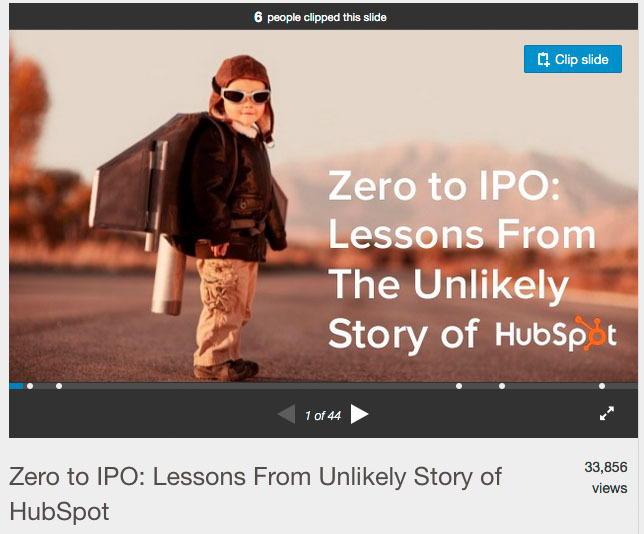 Tip: Use the SlideShare Clipping tool to highlight and share valuable content you’ve produced with your networks. Ultimately, you can build authority by developing LinkedIn SlideShares that present a unique point of view on industry news, insights, or your company culture. More than 1 million people have published more than 3 million posts on LinkedIn’s publishing platform. About 45% of readers are in the upper ranks of their industries, including managers, VPs, and CEOs. 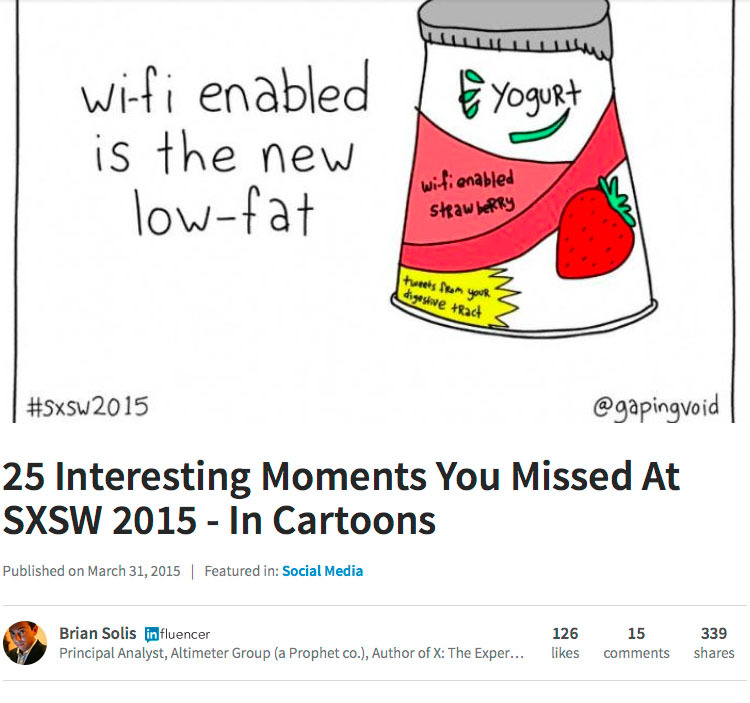 Brian Solis, principal analyst at Altimeter Group, shared his personal takeaways, aspirations, and highlights from SXSW with a creatively perceptive cartoon ebook. Suggested time commitment for success: 1 hour weekly/3 hours monthly. To ensure you succeed with LinkedIn Publisher, publish whenever you feel passionate or on a monthly basis. If you need some inspiration, get the LinkedIn Pulse app for Android or iOS to see what content is currently trending in your industry. In this post, Justin Gray, CEO of LeadMD, Inc., shared what he looks for when he hires people. It’s not exactly traditional HR wisdom, but he tells it in a personal and unique way. 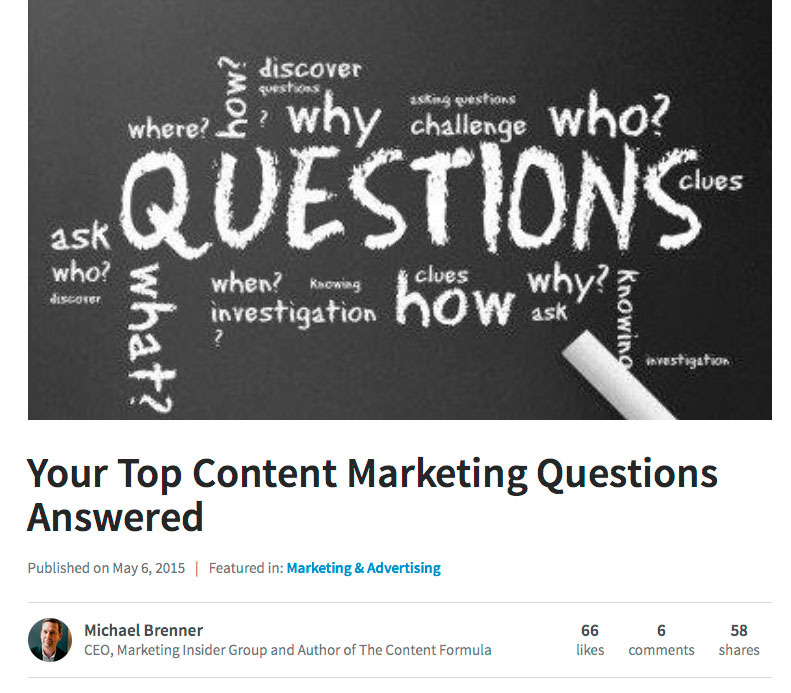 Michael Brenner, CEO of Marketing Insider Group, wrote a helpful and relevant post answering followers’ questions about content marketing. Crowdsourcing sentiment and seeing which conversations are hot are great ways to find ideas for topics to write about. First, what’s the difference between sponsored content and direct sponsored content? LinkedIn sponsored content allow you to publish relevant content and reach a targeted audience of professionals beyond just your LinkedIn company page followers. Direct sponsored content allows you to share content directly in the feed. This gives you the ability to personalize and test content without having to originate posts on your company page. You can make your content more relevant by sending personalized messages to specific audiences. Then test and retest a variety of content in real time to optimize performance. You can generate quality leads by sharing insights that professionals seek. Then watch that content spread via the peer sharing that occurs naturally on LinkedIn. 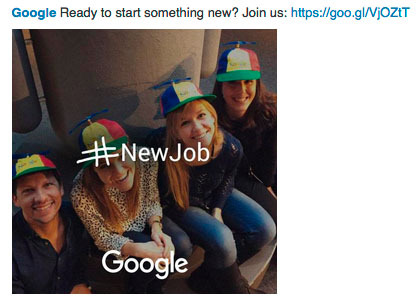 Google keeps it short and sweet (and highly visual) in this promoted post as they search for top talent. 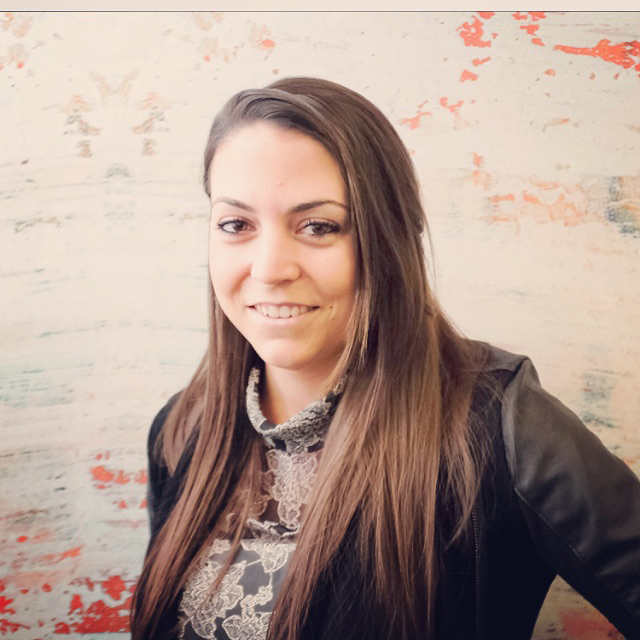 Percolate Inc. drives registrations for a webinar featuring industry leaders within and outside of the company. Tip: 75% of engagement with sponsored updates comes from mobile devices. Make sure your website or landing page design is responsive. Select a compelling visual (1200 x 627 pixel image). Keep your caption short and sweet, using fewer than 150 characters. Run 2-4 sponsored content a week. Run sponsored content for three weeks, then test and iterate. Add URL tracking codes to measure post-click. Track actions like site visits or conversions. Set up campaigns by audience. Shift your budget to the audience with the highest engagement rate. Dell highlights the results of recent research that their target audience craves. Check out some of the top trends in LinkedIn sponsored content in 2015. Companies often talk about “joining the conversation” and “establishing thought leadership.” LinkedIn groups are a perfect way to build an engaged community on the platform. Participating in groups is rewarding for many professionals and a successful group is often a direct reflection of the time, energy, and effort of the people who manage them: the group moderators. Use groups as a forum for discussion (but avoid self-promotion). Use groups as a catalyst for thought leadership and community. Spark conversations about industry trends and challenges. Ask questions to crowdsource sentiment. This discussion in HubSpot’s Inbound Marketers group sparked a conversation about 2016 trends and shared a helpful framework for tracking success. Create a group for your company and assign ownership and duties. Ask for opinions and provide unique insights. Manage and monitor post submissions daily. Promote your group across social media channels for increased membership. Join other relevant industry groups. Initiate and participate in group discussions. Check out the LinkedIn Groups: A Moderator’s Field Guide to learn how to effectively engage and grow your group. As you can see, LinkedIn offers a number of opportunities to get your content in front of the business professionals who are waiting to consume it. This will help you build brand awareness, develop relationships with prospects, and drive quality leads. Are you using these LinkedIn content marketing tools? Have your efforts been successful? Optimize your content strategy on LinkedIn by downloading The LinkedIn Content Marketing Tactical Plan.